Plastic Man #6 Review – AiPT! The Plastic Man miniseries ends as well as it began. Definitely a series to recommend to new fans. The final issue of Plastic Man is here and overall I’d say it was pretty good, barring one or two things. As usual Gail Simone has some great writing which is accompanied by Adriana Melo’s equally great art. The ending of the miniseries comes to a nice close while also leaving potential for a second one set after, continuing the story. The finale of this issue sets up the possibility of continuing which is both good and bad for me. On the one hand, I’d love to see more of this series by a fantastic creative team, however on the other I find it rather annoying that there are plot threads left dangling which have the possibility of not being addressed again. However, the threads that are addressed do so in a very satisfying and entertaining fashion. Another great takeaway for this issue, at least for me personally, is that this issue fully confirms that the young boy, who calls himself the Suave Prince, is transgender. Unsurprisingly, as Gail Simone pushes the boundaries when it comes to representation in characters — she similarly tried to have a transgender character, Alyssa Yeon, in Batgirl. This full confirmation in this issue really made the whole series even more for me as it was a great piece of representation. 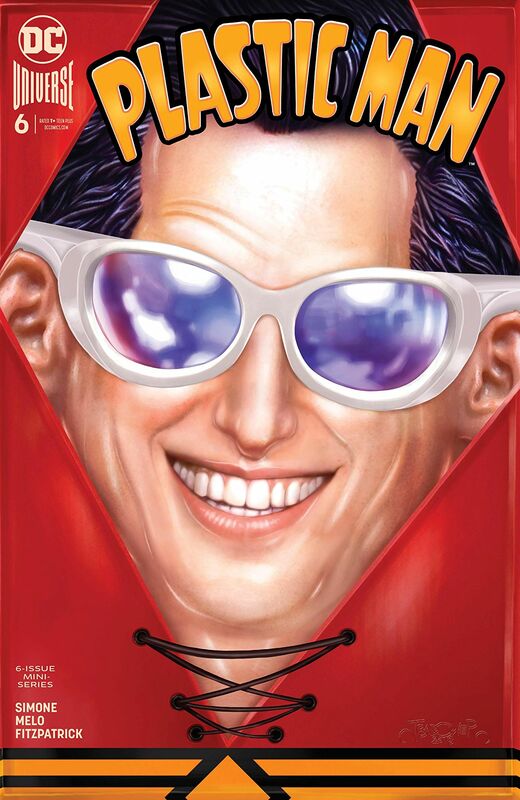 Plastic Man was a fantastic, fun miniseries that can easily be recommended as a great starting point to anybody interested in the character. Gail Simone brings in some fantastic and fun writing..
..that is complemented perfectly by Adriana Melo's storytelling ability through her artwork. The cover is both creepy and fun at the same time. Simone fantastically adds even more trans representation with the miniseries as a whole. There are some loose ends that are left untangled and sets itself up for a second miniseries.